The initiative, which took place in Port Elizabeth, is aimed at raising awareness for kids born with a cleft pallet. 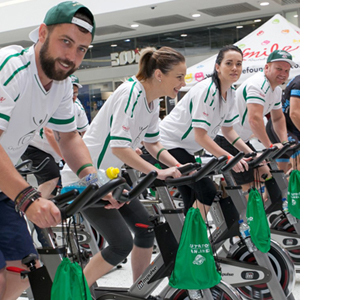 As sponsor, SVL was responsible for the transportation of the exercise bikes, to and from the event. This year SVL also donated goodie bags and spot prizes to participants. SVL staff members were so excited to be part of the initiative that they also committed to cycling a 50 minute spinning class. SVL is honoured to be part of such a worthy cause. Stuttaford Van Lines has again thrown its full support behind the Smile Foundation’s Cyclethon 2016.